I saw a screening of the new Annie movie last week, and since it opens this week, I wanted to give a head’s up to other families touched by adoption. Most of us are familiar with the Annie story, and that it revolves heavily around her orphan status, her search for her birth family, and relationship with a new father figure. Mrs. Hannigan is a neglectful foster mother and much of the silly humor of Carol Burnett’s story is lost in this rendition. Mrs. Hannigan is no longer a goofy comic caricature . . . she’s a mean, desperate, sad, and resentful woman who lets the kids know that she’s only in it for the paycheck. Children who have been neglected or verbally abused may be triggered by this portrayal. The movie touches on themes of birth records and very heavy fantasy about birth family. When she sings “The Sun Will Come Out” there is a dream sequence where Annie is imagining herself in a family and walking down the street seeing happy families together. The song was emotional to watch, and honestly, I wasn’t expecting it to be quite so dark. During this song, she looks at a photo of herself as an abandoned 4-year-old, which no doubt would resonate with children adopted at an older age. Initially, Annie is simply a commodity in the movie, and she realizes it. Her foster mother is using her for a paycheck, and Mr. Stacks is using her for good PR. She is cognizant of the fact that she is not really loved, and speaks up about it. Annie is so consumed with finding her birth family that she visits the spot she was abandoned on a weekly basis. She struggles with loyalties towards her birth family and her growing affection for her new father figure. Comparisons to the original Annie are inevitable, and I thought this new adaption was considerably more gritty. It felt like more of a drama than a comedy . . . so much so that the movie seemed to be having an identity crisis. It seemed tentative about being a full-scale musical and many of the musical numbers that served to buffer the emotional content had been removed, or replaced with more emotional numbers. It was not the syrupy musical that the original was. The acting also intensified the themes. 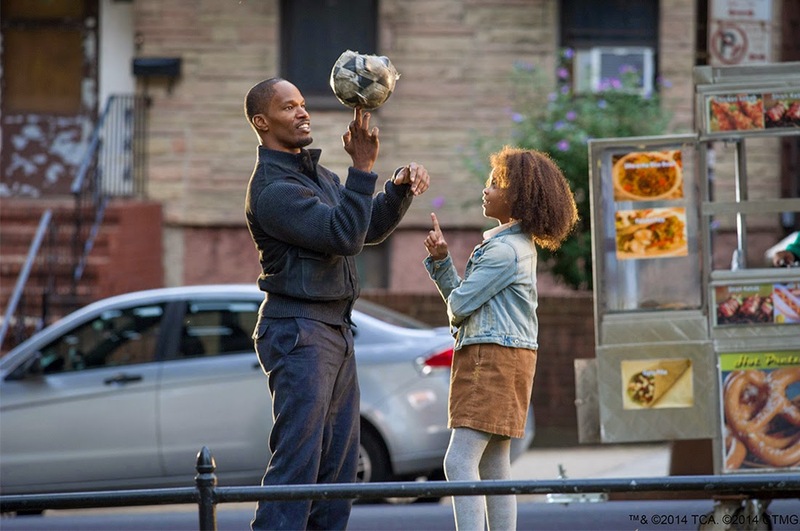 Quvenzhané Wallis gave an amazing performance but there was an emotional complexity to her characterization of Annie . . . she was not the happy-go-lucky Annie of previous versions. There was a melancholy about her performance that was true to the story, but that heightened the drama. Still, her character was a very positive portrayal of a young woman whose bravery, tenacity, and determination help her rise above her circumstances. Ultimately my kids felt it was adoption-positive and enjoyed the movie, but as a parent I was a bit surprised at how heavy it was. It’s not a movie I would have on repeat play at home the way I might with other musicals. Adoptive parents who are parenting kids who spent time in foster care, who were adopted at an older age, or who experienced abandonment may want to preview the movie first. All adoptive parents should leave time and space after the movie to process, as it’s likely to bring up a variety of feelings for our kids. Im really confused, it almost sounds like you are saying that this version of Annie would not be a good selection because it wasnt whimsical enough for you as a musical? "Annie . . . she was not the happy-go-lucky Annie of previous versions". It was always odd to me how happy go lucky she was for her situation, not just for Annie but other character in the movie. You talk about Ms. Hannigan… "Mrs. Hannigan is no longer a goofy comic caricature . . . she's a mean, desperate, sad, and resentful woman who lets the kids know that she's only in it for the paycheck" … Well wasnt she always that way?? In the 1982 version she pranced around the room drunkenly while always ignoring the children and literally sung about steping on there "freckled faces" and how resentful she was of not being able to have a normal life because she had all these little girls to take care of. Personally I felt it was a more accurate potrayal of being in foster care system then the whimsical 1982 version of Annie.